November 13-16 marks the 19th anniversary of International Education Week (IEW), an annual celebration of international education and exchange worldwide. 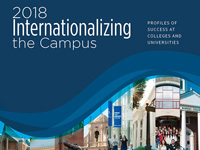 Institutions across the United States and around the world are hosting events throughout the week to recognize international students, education abroad, and internationalization. Expand perspectives, foster dialogue, and build recognition and support of international education with NAFSA programs and resources during International Education Week. NAFSA will offer several online and in-person community events that you can share with campus program staff. Topics include campus internationalization, democracy, research, and the economic impact of international students in your local area. Join the 2018 Senator Paul Simon Award Presidential Panel live webcast from Washington, D.C. Watch this annual gathering of leaders from Simon Award-winning institutions as they discuss their successes in campus internationalization. This event is accessible free of charge. NAFSA’s International Education Town Hall recognizes the latest innovation, collaboration, and diversification strategies, as well as reflects on ways to be resilient as we face challenges in our daily work. Ravi Shankar, NAFSA's vice president for education and professional development and director of the International Center at Northwestern University, hosts the event. Share your own personal achievements and insights with the community. The challenges we face around the world today are extraordinary. To address these challenges, in March 2018 the Atlantic Council and its partners convened a special meeting of foreign former ministers, distinguished officials, and strategists from the world’s leading democracies to outline a set of fundamental principles for advancing a new global order. The November 2018 roundtable dialogue convened a select group of student delegates from universities in the Washington, D.C., area for a discussion and exchange of views on what principles should be included in the declaration and prospects for the future of a rules-based global order. The NAFSA Research Symposium serves as a venue for the research community in the field of international education and related disciplines to share original unpublished work and discuss research problems in an academic and professional environment. The Research Symposium is considered relevant to international education researchers and scholars at every stage of their career – graduate students, post-docs, faculty members and practitioners. Obtain the latest information about the economic contributions of international students and their families to the United States. Sort the data at the national level and by state, region, and congressional district to get a clear picture of just how much the United States benefits from international education. View 10-year trends and detailed job sector analysis. And, use data in advocacy with institutional leadership as well as government officials. This resource is available free of charge.